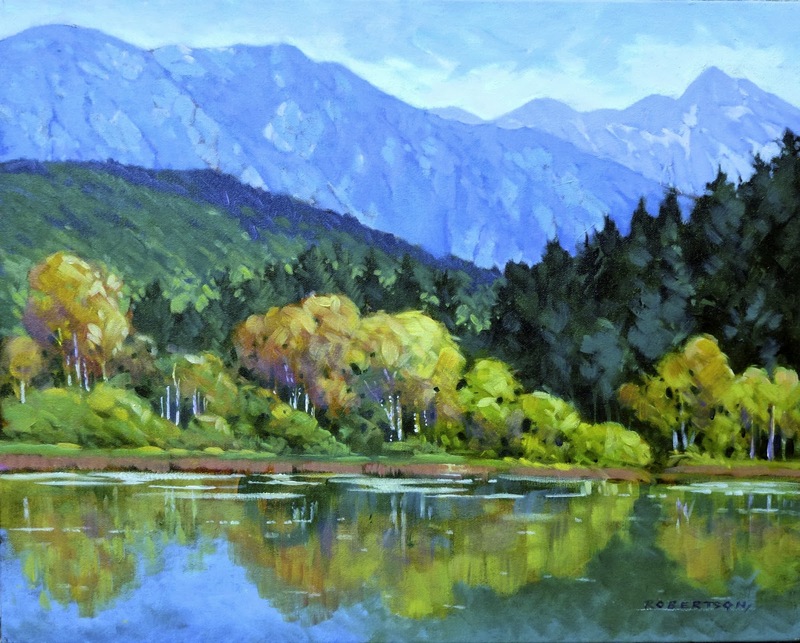 Last week Alan and I were at Whistler at the Federation of Canadian Artist's annual Plien Air painting workshop. We had a wonderful time. Hanging out with fellow artists in a spectacular natural setting is my favourite thing to do. Despite a poor weather forecast, we managed to stay dry most of the time. One of the new features of the workshop this year were goodie bags for every participating artist. We got magazines, brushes, gift certificates and lots of other stuff- pretty fun. Kind of like opening your stocking at Christmas. One of the gifts in the goodie bag was a set of 3 tubes of Golden slow drying acrylics. I had never tried them before so I decided to do this 16 x 20 painting with just those colours, plus white. I found the paint to have a bit of a scratchy feel, but the three pigments made some lovely colours. I will try them again in another painting. The pigments are; quinacridone magenta, pthalo blue [green shade], and bismuth vanadate yellow. A big thanks to Susie Cipolla, Lianne Gulka and the rest of the team that created such a great experience for us all. The workshop will happen again next year in Whistler so try to make it if you can- you will learn so much and have fun while you're doing it. This is my last painting for the feature at the Peninsula Gallery next weekend. The top image is nearly finished and the second image is after the final tweaking. I decided that I didn't like the shape of the foreground rock- too pointy on top. I reshaped a few of the rocks, added more details and reinforced the darks in some areas. The left foreground puddles seemed too dark to me so I made them lighter. Added sparkles in the water. 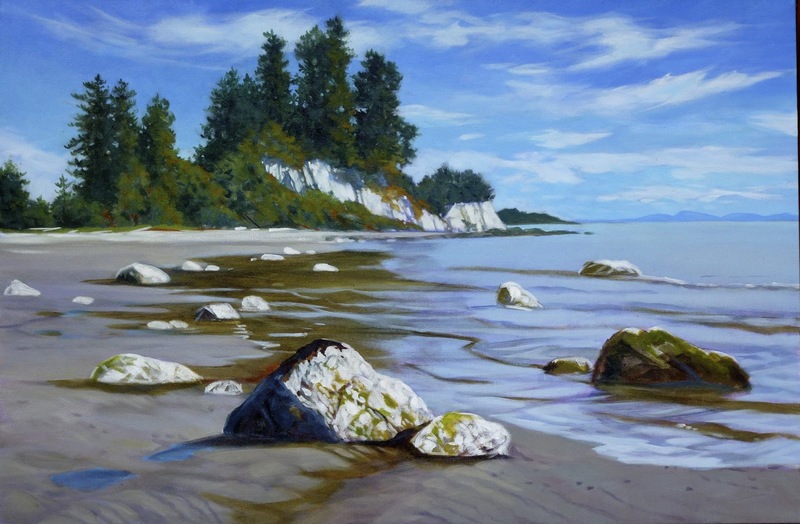 I also put some subtle blue glazes on the distant white cliffs so they would be a cooler value than the white in the foreground rocks. 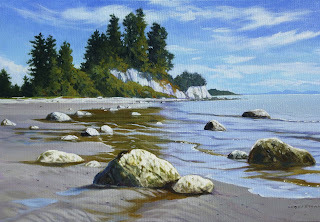 I will be demonstrating from 1:00 to 4:00 on Saturday, Sept 7th at the Peninsula Gallery in Sidney. Everyone welcome.